What photoperiod do you keep in the inside part of your facility? I switch the lights on at 6am and switch them off at 7-8pm. Do you lock birds in the inside part at the night? Yes. I do this because of martens. One visits our garden regularly. We haven’t catched it yet. It’s a cunning creature. 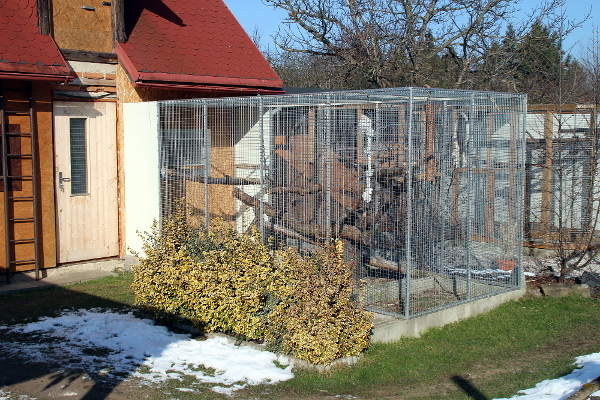 There are also many birds of prey which attack the outside aviaries. At what time do you let the birds go outside in the morning? Do you have any troubles with your neighbours? I have very good relationship with neighbours. During the week I let the birds go outside at 8am and close them at 7pm. At the weekend the windows are open at 10-11am and closed at 5-6pm. Neighbours are just fine and I don’t want to start any conflict. Let’s talk about feeding. You have showed me lots of mixtures. Do you prefer any brand or you make your own mix? We have mixed by ourself but we don’t do this anymore. 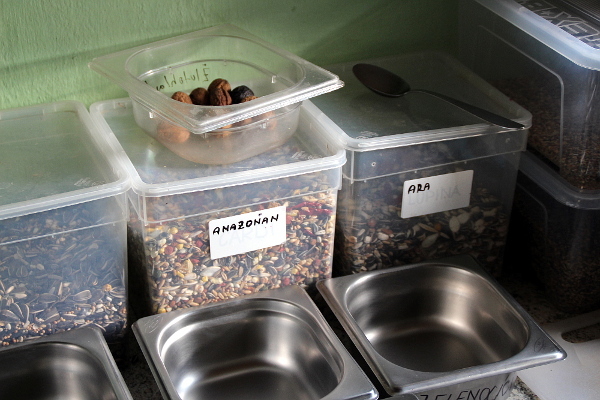 Now we buy mixtures from Versele Laga for amazon parrots and macaws. For weavers I use Teurlings and Manitoba. I’ve started using the latter one recently and birds like it very much so will feed with this mixture only now. Have you tried Manitoba for large parrots also? The distributor of this brand should visit me soon and I’ve asked him to bring some samples so we will see. I would like to try if the quality is the same as in the product for weavers. I would feed it if parrot like it, why not. What’s your daily diet based on? Do you feed once or twice a day? Once. I wake up every morning at 5 am so I don’t have enough time to feed them in the morning. Mostly I feed after the work at 2-3 pm. Birds are used to this schedule and are comfortable with that. Do you add any synthetic vitamins, probiotics or other product? I add probiotics to egg food when parents feed their chicks. To my mind, it’s very important as some birds can deal with digestive troubles. I had a pair of the Black-winged Lovebird and they start nesting after 1,5 year. However, chicks have always died. When I added probiotics, situation got better. 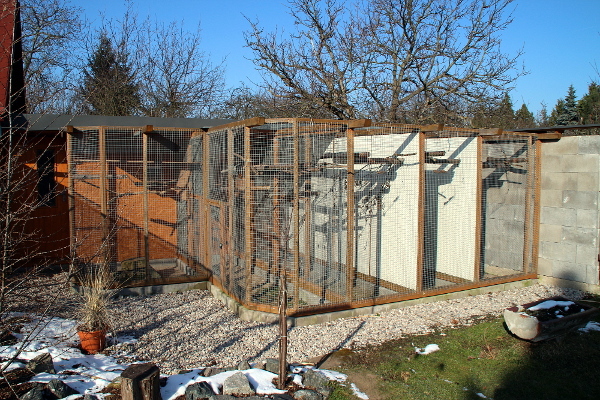 How often do you clean your aviaries? Many breeders say that cleaning can disturb the birds, especially when nesting. On the other hand, hygiene is also very important when you want to avoid spreading of diseases. I clean aviaries once a week. I clear away all feces, sweep the floor and hoover the cobwebs. Down feathers and dust can also cause the lung disfunction. But it’s not my problem as I keep my aviaries really clean. I disinfect aviaries twice a year with F10 and I have never experienced any serious infection in my collection. So you haven’t solved any veterinary issue with your birds yet? Actually, I had worms in my collection. Don’t know when they get to the facility. Within two days I have lost 10 Swift Parrots. I applied Panacur immediately when I found it out but it was too late. I guess that worms have spread also to other birds? Yes, they did. I let test samples of feces of all the birds by Dr. Necasova and she found out worms in all but two species. I got the medicine and all birds have recovered. Now I do this twice a year as prevention. Just to be sure. Most of your large parrots are still young. Do you breed any? I can see there is still some free space for new aviaries. What are your plans for the future? I would love to acquire Green-thighed Parrots. One or two pairs. 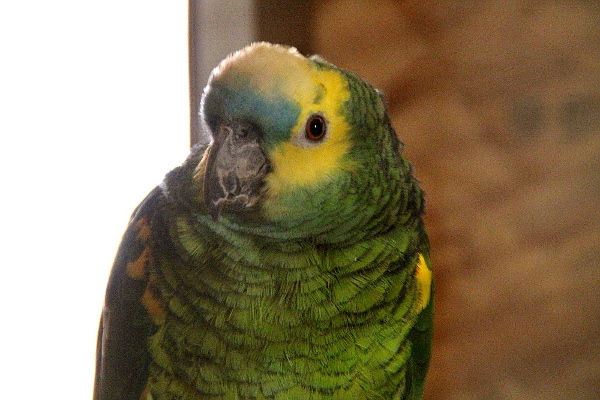 And maybe if I sell my pair of Blue-fronted Amazon then I could buy a pair of Double Yellow-headed Amazon of subspecies magna. Of course I have also some dream species but we will see. As for amazons you have, what are your most favourite ones? I guess it’s the Green-cheeked Amazon and also the Red-lored Amazon. I love their coloration. 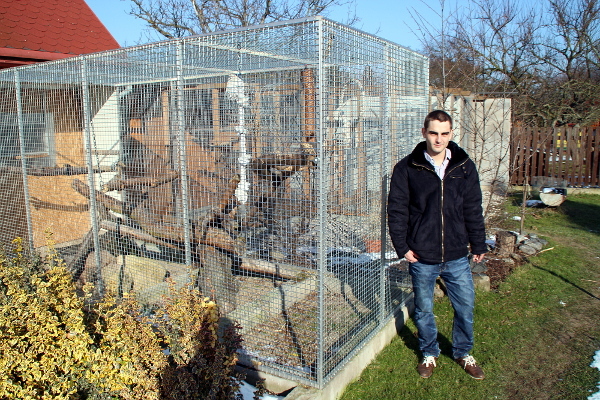 So are you going to build any extra aviaries? I would love to but it’s a matter of money and place. Maybe ten more aviaries. Do you have any idea about the species which would be there? 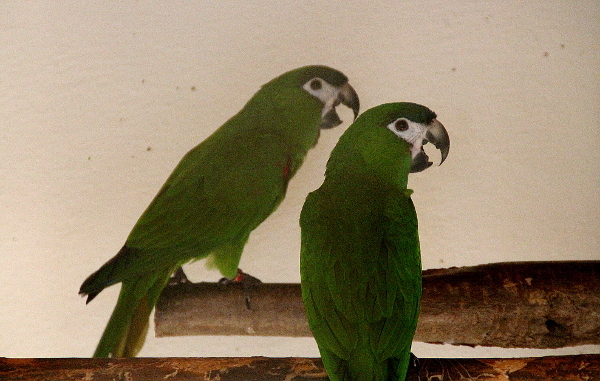 Some green southamerican parrots, definitely. I like the Blue-bellied Parrot a lot. I could get them but I have to save the money firstly. Exactly. I don’t say that I wouldn’t have money for that but it would be great if money from offspring would pay new birds.